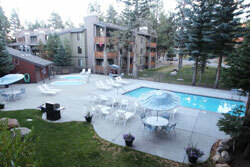 Pet Friendly By Owner Rentals in Mammoth! Want to do a search for yourself? Try vrbo/homeaway- filtered for Mammoth - just select your dates and how many people you need to sleep! Or try Trip Advisor already filtered for Mammoth and petfriendly. My strawberry hand-picked selection is below!They have the best reviews. New! 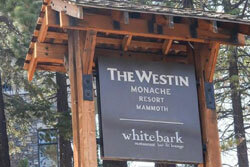 wheelchair accessible, petfriendly, by owner rentals in Mammoth. 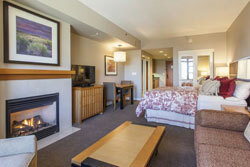 White Mountain Lodge - 1BR/1BA, sleeps 4; min stay 2 nights, Avg $240/nt - BOOK IT! Enjoy the year-round heated pool, 3 Jacuzzis, workout rooms, free Wifi, gondola, shopping, restaurants, and underground heated parking. Non-smoking. Pet friendly (with a one-time, non-refundable fee of $75/stay/dog). Beautiful Upgraded Village Condo Just Steps To Gondola! - Book it! Queen size sleeper sofa with comfortable new premium 5 inch Gel Foam Mattress. 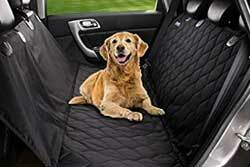 Pets allowed, 2 maximum, with combined weight less than 120 pounds. Beautiful Upper Floor Luxurious Extra Large Studio, Pet Friendly, Sleeps up to 4 - 0BR/1BA, sleeps 4; min stay 2-7 nights, Avg $228/nt - BOOK IT - Instant Confirmation! VRBO #234894 - Pet friendly AND WHEELCHAIR ACCESSIBLE. 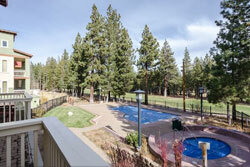 Come enjoy this scenic high floor luxury studio condo with views of the White Mountains and the Village. 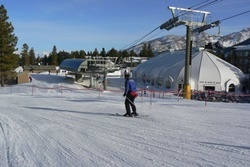 The Monache is located next to the Village, about a 100 foot walk to the gondola to the slopes and the village. Ski back trail for those not wanting to ride the gondola back down. After a long day on the slopes or hiking trails, wind down in the soothing serenity of our Deluxe Studio suites. This airy, open-plan studios offer the comforts of home, with living and sleeping area all in one room plus a convenient kitchenette. Sink into the plush king Angelic Bed or stretch out on the cozy sofa (which opens into an extra full-size bed). The temptations of the village are just steps away, but nights in are utterly relaxing with a roaring fire and sleek LCD TV. 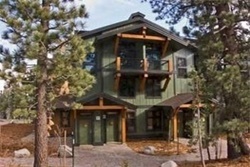 Homeaway #174249 - Home away from home, welcome to Mammoth Lakes! 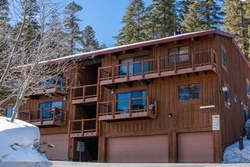 This brand new remodeled one bedroom plus, two bath unit right next to Canyon Ski Lodge and close to The Village At Mammoth has everything you can imagine and more to make your vacation a life long memory! Private and convenient, we are located in building G, end unit adjacent to the pool, indoor sauna, outdoor BBQ and ski back trail to the Village! Amenities include: A large open and spacious living area with a dinning area, rock fireplace, hardwood floors, ceiling fans, comfy couches, 42' LED TV, Fiber optic High Speed Internet, DVD, Cable TV, etc., The brand new kitchen is fully equipped with Knotty Alder cabinets and Granite counter tops, modern stainless steel kitchen appliances, cookware, dinnerware, etc. A large spacious master bedroom with a brand new remodeled master bath with travertine tile shower, fixtures etc, king size bed and bedroom set, ceiling fan, 40' LED TV complete the master bedroom. 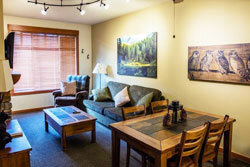 Snowcreek Road Condo, Sleeps 5 - 1BR/1BA, sleeps 5; no minimum stay, Avg $258/nt - BOOK IT! 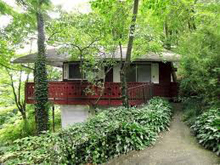 Homeaway #3859461 - Pet friendly AND WHEELCHAIR ACCESSIBLE. The cabin is fully stocked with amenities. 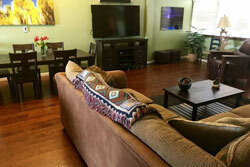 There is cable TV, DVD player, wireless internet, and underground parking in a reserved space. We do not live in Mammoth. This is our second home. Mammoth is such a special place. It is designed to accommodate all types of sports enthusiasts as a year-round destination. Whether you are coming for a ski vacation or a fishing trip this is the place to be! 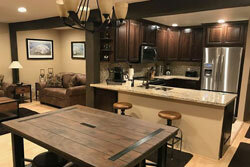 Canyon Lodge at Sierra Megeve Condo, 2BR/2BA, Sleeps 6 - 2BR/2BA, sleeps 6; min stay 2 nights, Avg $185/nt - BOOK IT! Luxurious Condo-Next to the Village. Dogs Considered. 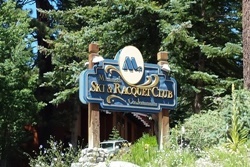 VRBO #502076 - Walk to Village and Gondola, remodeled chef's kitchen, marble counters, heated travertine floors, large open floor plan with vaulted ceilings, Wifi, HD flat screens, forested play area in front of unit. 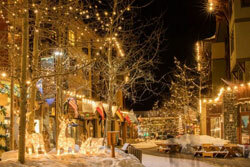 -- Leave your car parked, walk to the gondola and the village. -- Newly installed hardwood floors and new carpet in the bedrooms. -- All new furniture in living room and master bedroom. -- New king bed in master bedroom. -- New updated/remodeled chef's kitchen. -- Large open floor plan with vaulted ceilings. -- Remodeled master and guest bathrooms. -- New 70" HDTV flat screen w/ DVR/DVD upstairs. -- New HDTV flat screen w/ DVR in Master bedroom. 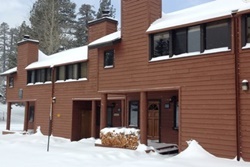 Snowcreek Solitude 3BR Apartment Rental, Sleeps 9 - 3BR/3BA, sleeps 9; min stay nights, Avg $460/nt - BOOK IT! 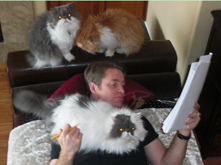 Pets allowed for $25/day, pets stay free provided proof they can ski or snowboard!